Superstar writer Jonathan Hickman bids farewell to the FF! In a story that kicks off in Spider-Man and the Human Torch's bathroom (?! 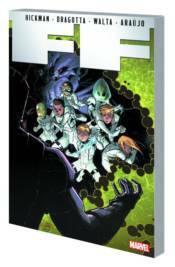 ), the Future Foundation explores the farthest reaches of the Marvel Universe - from Wakanda to the Negative Zone - encountering the Wizard, the Universal Inhumans and the Negative Zone's dark overlord himself, Annihilus, along the way! And in the heartwarming conclusion to Hickman's run, Old Franklin teaches Young Franklin 'How To Be a God!' Collecting FF (2011) #17-23.